Heyyy! What a wedding I have to share with you guys! Alex and Mick had a completely chilled out day surrounded by friends and family at Crook Hall. 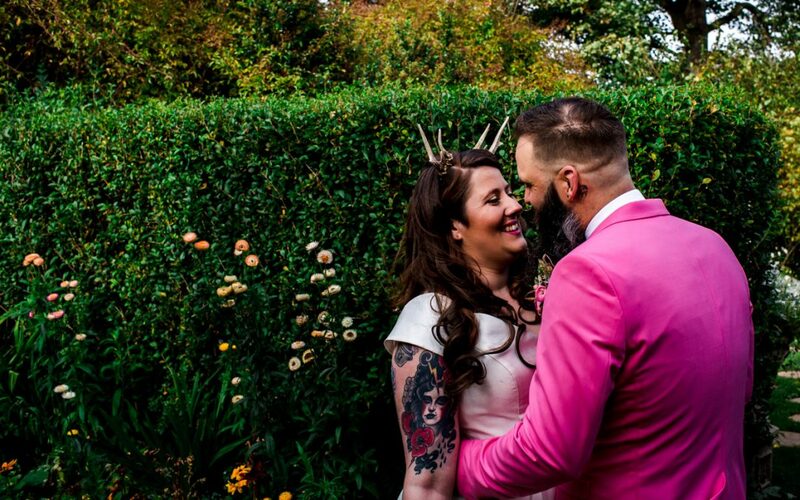 There was Dogs, Antlers, Music, Skulls, Tattoos, Mulled Cider and Pumpkins, To name just a few things that made this wedding incredible! Eeeek! This wedding has also been featured on the SUPER cool American blog Offbeat Bride. I dont need to go on and on about how much I LOVE Crook Hall, you’ve probably read it on loads of other blog posts. But just know, it is an incredible place with the loveliest staff, and the food is incredible too! Alex and Micks wedding was totally relaxed and full of lots of laughs. They knew they wanted the day to be chilled out, and Crook Hall lends itself perfectly to this. After the day itself, these guys walked through Durham city and went to different pubs for the night. “Originally the plan was for Mick to play me down the aisle with an acoustic version of Everlasting Light by the Black Keys on his guitar – which no one but myself and certain members of the bridal party knew about. He blew every single one of us away when he started singing acapella style and left very few dry eyes in the place as Dad and I made our way toward him. Afterwards he confessed to me his hands were shaking too badly to play! Our two dogs naturally had to be there; our boy Gatsby with Mick’s Groomsmen and my old girl Skylar walked ahead of me as one of my bridesmaids. It felt amazing to have everyone there who meant something to us and had been part of our lives, but I couldn’t peel my eyes off of Mick nor he me. We’ve both said it was like realising we were in love for the first time all over again. Without even thinking we kissed as we greeted each other and it was impossible not to steal a couple of cheeky pecks between the vows we had chosen! As You’ll see from the pictures, this was a simply lush wedding, and there was even a surprise announcement that Alex is pregnant during the speeches!! Woohoo!! I hope you love looking through them! Love What you See!? Course You do! Drop your info below and i’ll send you a brochure!